Mealtimes used to be rough for me and my kids. I felt like it was a battle to get them to eat anything at mealtime, let alone broccoli. So I decided to put up a visual Toddler Mealtime Schedule and Menu. I must say, it has helped TREMENDOUSLY. I recently read It’s Not About the Broccoli, by Dina Rose, PhD. I like her technique called The Big Fix. You decide when your children eat. You do this by identifying Eating Zones. You decide what your children eat. By implementing the Rotation Rule, you’ll form the foundation for good eating habits without having to introduce new or disliked foods. Within the framework of the first two rules, you systematically allow your children some control. You give them choices. I have only recently implemented this technique in our household, and so far, it is working quite well. My first goal is to get my picky eater, Jeremy, to eat at dinner time. After that, I will work on getting him to choose more fruits and veggies for his meals. I am a very visual person, so I decided to post our designated eating times and a board with approved foods for my toddlers to chose from. My son, like almost every other toddler, finds order and security in always knowing what will happen next. Having scheduled eating times and a planned menu really helped make mealtime less stressful. Also, allowing him to choose what foods he was served made him more agreeable to eating. I have our visual Toddler Mealtime Schedule and Menu posted on the side of our refrigerator. In her book, Dina Rose discusses providing a reasonable time structure for both snacks and meals. I serve breakfast anywhere between 8 am and 9:30 am (depending on what time my kids get up). Then a morning snack between 10 am and 10:30am, lunch between 12 pm and 1 pm, afternoon snack between 3 pm and 4 pm, and finally dinner between 5 pm and 6 pm. Most days we stick with this schedule, but things happen and I have to be flexible. I serve the meal during our specified time. If my kids are not hungry, or don’t like what is being served, they can decline to eat. They just have to wait until the next Eating Zone to fill their tummies. Putting this rule in place has been working, not only for my kids, but for me as well. I am not longer mindlessly snacking between meals. I’m setting the example for Jeremy and Sierra to follow. Following this technique gently persuaded my picky eaters to expect variety. If my son had his way, he would eat cereal and milk for almost every meal. So I still allow him to eat his cereal and milk, he just has to have something different (either a different kind of cereal or different food altogether) the next day. I made a list of every food my that my picky eater has willing eaten. To my surprise, that list was longer than I had expected. I edited out most of the junk food. I did not include cookies, ice cream, candy, or other poor nutritive foods. 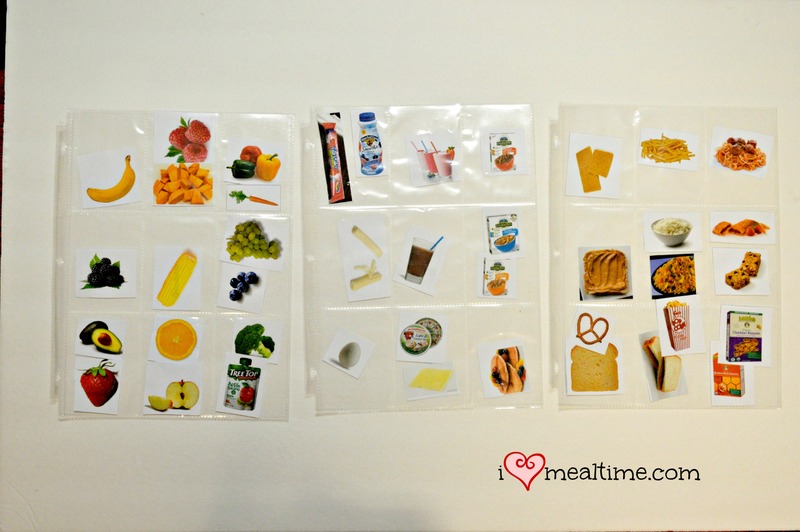 I printed a picture of each of the foods that my kids ate, cut them out individually, and placed them in trading card page protectors. This way the kids could choose what foods they wanted to eat, then we’d place them in the display pocket for that particular mealtime. My pickiest eater, Jeremy, loves this approach. It’s fun for him to choose what goes on his menu. Amazingly, he started to eat foods that we both have forgotten about. He chose to have boiled eggs and yogurt for lunch the other day. He is excited for our mealtimes! AND I am excited too! For all meals, except dinner, the kids choose what to eat. At dinner time though, I let them pick the side dishes and my husband and I choose the main dish. This way there is something on the dinner plate that everyone will eat. And sometimes, my son will actually try a new dish. He won’t always like it, but he has started to try it instead of immediately rejecting it. That’s great progress in my mind! So far, this new approach to mealtimes in our home has been good. The hardest part for me is to relax and not stress out if my kids do not want to eat. I know that there will be another opportunity for them to eat later, and this teaches them the consequence of missing a meal; hunger. My daughter, Sierra, is approaching 2 years old and she is beginning to exercise more control over her environment. While she is not as picky as my son Jeremy, she has started saying no to foods that she used to eat right up. I am hoping that this technique works for her too. Have any questions or suggestions? Leave me a comment. I am always happy to hear from you! Cheers!